VI appointed Governor and Opposition a no show! The USVI Government, headed by its elected Governor John P. de Jongh Jr. and Lieutenant Governor Gregory R. Francis, rolled out the red carpet Saturday as it welcomed people from both the U.S. Virgin Islands and the Virgin Islands (VI) to celebrate the 39th annual USVI-VI Friendship Day. The VI delegation was headed by leader of Government business and Premier Dr. the Honourable D. Orlando Smith with many of his Ministers and other elected officials being on hand. While the United Kingdom appointed Governor Boyd McCleary was a no show, Deputy Governor V. Inez Archibald was on hand. No members of the Opposition Party in the House of Assembly attended the celebrations, however, many individuals received invitations from the USVI Governor's office to attend and made up the VI delegation. “We share a common culture. 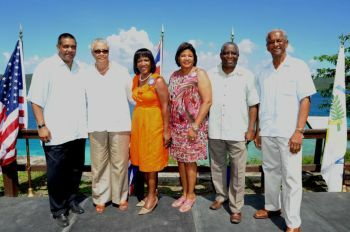 We celebrate the ties that bind us," was the theme repeated by speakers and many of those who attended the event, with several from the USVI speaking about their family roots from Tortola, and Virgin Gorda. “My mom is from Virgin Gorda, my dad from Tortola and my wife from Tortola,” St. John resident Jose Penn told the Virgin Islands Source newspaper. Premier Dr. Smith and his delegation were greeted at the U.S. Customs and Border Protection facility in Cruz Bay by steel pan music. The celebration started at Cruz Bay Park, where students from Julius E. Sprauve, Guy Benjamin and Gifft Hill Schools sang several songs. It spilled out to the street for a small parade featuring the Sprauve School Gulls band, the Rainbow Dancers from Gifft Hill, the Love City Leapers jump rope team, and others according to the VI Source. 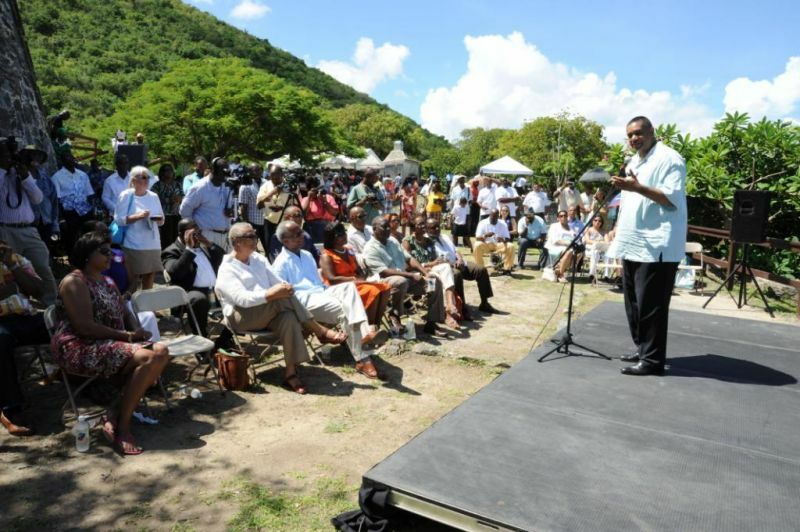 The buffet breakfast in the park, gave all sides a time to mix and mingle and for Dr. Smith to introduce his new Ministers of Government and others to their counterparts, appointed Commissioners who are members of Gov. de Jongh’s Cabinet and elected Senators from the USVI Legislature. The activities shifted to the USVI National Park’s Annaberg Plantation, where organizers had a slew of cultural demonstrations set up among the ruins. It was a time to see officials dancing from both sides including Gov. John P. de Jongh Jr., VI Deputy Governor V. Inez Archibald and VI Premier Dr. the Honourable D. Orlando Smith. Dr. Smith in his speech told the attendees that economics brought the VI and USVI closer together, and suggested that a third of those living in the USVI territory population have VI roots. The USVI Governor made news by suggesting that the VI might consider a joint marketing campaign with the USVI. Lyada Lohr from the VI Source contributed to this story. The VI Source.com is one of Virgin Islands News Online’s many media partners in the USVI. Hats off VINO I never even knew about this..somebody dropped the ball on this one! i agree with spin i have not seen this important information on any other news sites!! How come john de Jongh always got so much security like he is the president eh? was this a secret too? Same thing I was asking "critic" did not even see a press release from GIS…we going backwards fast! I would think it would have been adventageous for District one Andrew to go considering west end is the front door to the BVI and closely connected to St Thomas. Maybe he could have brought up later ferries to connect with air flights for in-coming visitors. plant the seed. The more dialogue and networking the more one learns and gets recognized, all good in politics. Your comments may seem good on the surface but I find them them to be sooo distasteful. Fahie is in the Opposition & for sure Orlando them done prove that they ain't accepting any ideas from the Opposition. Also what whether he attends this fake friendship, although needed, function or not matters. How do you know what the man had to do that was more important or urgent than this. You are trying to plant evil seeds in your blog. You know that what you blogged would never be allowed by the NDP. Just give Fahie a break & leave him out of this. When the NDP miss functions that I see Fahie to I don't see you blogging so back off of Fahie & stop wasting your time trying to make an issue out of trivial things. I was speaking as someone looking for an opportunity to get recognition for a district rep and problem-solve at the same time. It's called politics or even diplomacy. There is nothing evil intended but a way to work together. Both parties are guilty of taking their ball home and not play anymore. If NDP wouldn't allow it then shame on NDP. Fahie's district is the closet to St Thomas. Fahie may have been busy, but I contend that in order for a government to work for all the people, both sides have to play ball. So call me an idealist, but not evil... or distasteful. At least I was speaking my opinion openly and legally. These DG critics ought to give it a rest as she is not going anywhere her government is in!!!! Interestingly, this Governor, the government and the Public Services Commission (PSC) treated Ms. Marjorie Smith and her ferry company so badly and now he's playing the consummate host to her first cousin, the Premier and his governmental officials from the Virgin Islands(British)! All in the name of so-called "family" relations!! Stop worry about dejoungh & Smith's ferry because Orlando made up for it by giving Smith a no bid contract for over quarter of a million dollars to do an extra Ferry run to Anegada from Tortola as soon as the NDP took office. The other Ferry had to tender to get the contract they have but we know his time is limited with the NDP in office. That's why eye-ra always defends them because they always looks out for him even if they have to break the rules while doing it. There was no secret. If you listen to the news you would have heard it advertised everyday. I heard it. Stop making something out of nothing. Can't wait for the bvi next election!!! I was unaware that we had bvi-usvi friendship day over the weekend!! I was there this was a good event very organized but a lil lil tight! Some of you NDP people hate Hon. Fahie so that an article like this which should not even be featuring him you all still come on here and include him in your blog. He got to be thorn in somebody's or somebodies side in the NDP. This man is a good man & to me Fahie is doing his job admirably as an Opposition Member. Thank God his back broad literally and figuratively. Fahie good thing you ain't went because I was there through so much crooks that I came home stink of crooks & I can't get it wash off up to now! I can see why some of you come on here and blog what you don't know about. 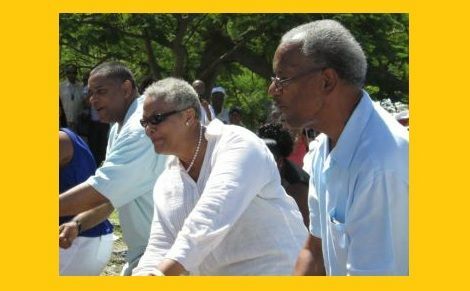 USVI/BVI Friendship day is celebrated every year around this time..part of our history and some of you all did not know this? Seems like some of you just depend on what the on line news post. Hope one day you all don't believe the wrong thing posted.. SO what, "Stoppit". She is a Smith and if the Premier had given her a billlion dollar contract to operate the ferry services, I still would not be upset. "If honey in the rock, Virgin Islanders(British) MUST GET THEIR SHARE!! !